I was asked recently how I did my butter icing. Now, I've never had a recipe. I've learnt from my Mum, who learnt from her Mum - all of us don't measure, but just throw it together. So I started hunting around online for a method that was similar to mine so I could share it ... and nothing. I could not find my butter icing recipe anywhere. All the ones I found added milk, hot water or cream. The butter icing (or frosting) I make is as simple as can be: icing sugar and margarine. 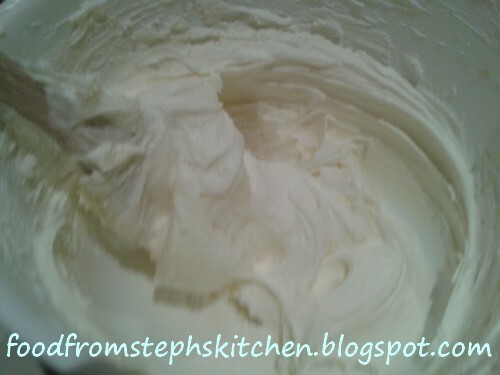 You could simply whip your butter up until fluffy, but I find it's easier and quicker with margarine. My family all use margarine instead of butter - mainly because I think it makes fluffier cakes (in my opinion). I use this icing for most of my cupcakes and cakes, the only variation being the flavouring I add at the end. The key to this icing is whipping up the margarine as you gradually add the icing sugar; the more you whip the fluffier the icing will be. It can be a little cream more than white depending on how yellow your butter or margarine is that you use. I use a brand that is a light yellow, but I know other brands can be very, very yellow. If you are really worried (and I've done this before) keep whipping your butter and more icing sugar, bit by bit, to change the colour. If it starts to get really thick simple whip some more, or if you are really worried at a dripple of hot water - I literally mean a dripple because you still want the icing to hold its shape! If making the icing to pipe on cupcakes I would recommend double the below, otherwise this is enough icing for icing a cake or spreading on cupcakes. 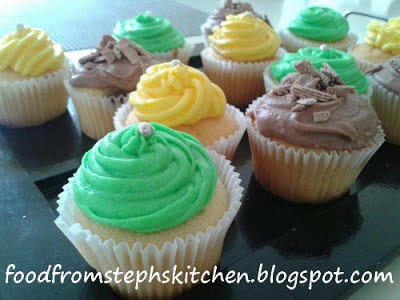 If you want a coloured icing, simple add food colouring once your icing is done. If you want another flavour, simple replace the vanilla to make a icing flavour of your choice. Here are a couple of my regulars! Chocolate butter icing: add only 1 tsp of vanilla, then take 2 Tbsp of coco and make a thick paste with a little bit of water. I have also added in melted dark or milk chocolate with a little cinnamon - which is yum! Strawberry butter icing: I always use strawberry essence - around 1 to 1 1/2 tsp depending how 'strawberry' you want the icing. It makes this lovely pink colour that I've used for strawberry cupcakes I recently made for a friend. However, don't be afraid to make your own flavour depending on what you are making - it's half the fun! There are so many different essence flavours in the cake section of your supermarket. Make a note to pick one and try it next time you go out. If using butter whip up your butter first until it's fluffy - a little like the consistency that you would have if you creamed it with sugar in a cake recipe. If using margarine, whip it up for a couple of mins. You can use electric beaters, but I simply use a wooden spoon because this is what I'm used to. Gradually add your icing sugar, whipping it into the butter and getting it back to the same icing like consistency each time before adding some more sugar. Continue until you use all the sugar, whipping until fluffy. 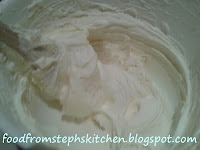 If it seems a little thick simply whip some more - it will soften and be fluffier! I always taste at this stage to make sure it doesn't taste too buttery. If all you can taste is margarine, add a little bit more sugar. However, 2 1/2 cups should give you a good balance ... I did just make this tonight to work out the measurements for you! As I said, I usually don't measure as I learnt by watching and tasting. Once you are happy with your basic icing mixture, add your flavouring - either vanilla, chocolate, or essence of your choice. 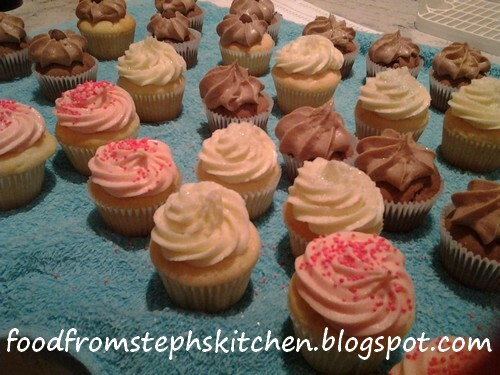 Then simply spread or pipe onto your cakes or cupcakes.